"The people of this continent alone have the right to decide their own destiny." James Knox Polk, eleventh president of the United States, served just one term in office, but in that time he was extremely influential in shaping the country's evolution into a large and politically formidable nation. Polk's primary achievements came in the area of foreign affairs, where he completed the annexation of Texas; directed the Mexican War (1846–48); and negotiated with Great Britain for the acquisition of the Oregon territory. In domestic policy, Polk was a strong advocate for lowering tariffs and establishing an independent treasury for the United States. Historians and presidential scholars consistently rate Polk among the most effective and important presidents of the United States. James Polk was born on November 2, 1795, in Mecklenburg County, North Carolina. He graduated from the University of North Carolina at Chapel Hill and went on to study law, establishing a successful practice in Columbia, Tennessee. Polk soon embarked on a political career, being elected to the Tennessee legislature in 1823 and the U.S. House of Representatives in 1825. In Congress, Polk fought to defend individual freedoms, the rights of the states against the centralizing tendencies of the national government, and a strict interpretation of the Constitution. In 1839 Polk was elected governor of Tennessee. However, his two-year term in office was undistinguished, and he was defeated in the 1841 and 1843 gubernatorial races. After his second defeat, Polk's political career appeared to be over, but events took a surprising turn. Martin Van Buren, who had served as Andrew Jackson's vice president from 1833 to 1837 and as president from 1837 to 1841, was expected to be the Democratic Party's presidential nominee for the 1844 election, but Van Buren's candidacy was derailed when he announced in April 1844 that he was opposed to the annexation of Texas on the grounds that it would constitute aggression against Mexico. Van Buren's support immediately eroded, because the annexation of Texas was a controversial political item widely supported by Andrew Jackson and his followers. By the time the Democrats held their nominating convention in late May, the party was in turmoil. Van Buren's supporters failed to generate the support needed for their candidate and Polk was nominated to be the presidential candidate instead. The Whig presidential candidate in 1844 was the powerful and influential Henry Clay of Kentucky, who had held important positions in both the House and the Senate in addition to serving as Secretary of State under John Quincy Adams. The campaign was hard fought and bitter. Polk eventually won with 170 electoral votes compared with Clay's 105; in the popular vote, Polk received just 38,000 more votes than Clay, out of the almost 2,700,000 votes cast. The Polk administration added approximately 1.2 million square miles to the United States, increasing its size by fifty percent. The addition resulted from the three major foreign policy matters Polk oversaw: the annexation of Texas, the Mexican War, and negotiations with Great Britain over the Oregon territory. Polk inherited the Texas issue from the administration of John Tyler. Tyler had wrestled with Congress over methods for annexing Texas, which had existed as the independent Lone Star Republic since winning its independence from Mexico in 1836. Tyler and Congress had agreed that Texas would be given the opportunity to vote for annexation, and Polk continued this approach. The Texas congress eventually approved annexation and wrote a state constitution, which the voters approved in a general Referendum. In December 1845 the U.S. Congress completed the transaction by admitting Texas as the twenty-eighth state. The annexation led to territorial disputes that resulted in war between the United States and Mexico. For several years relations between the United States and Mexico had been rocky, primarily because the United States had made financial claims against the Mexican government. Since winning its independence from Spain in the early 1820s, Mexico had had a series of unstable governments, and foreign nationals often had lost property during the resulting revolutions. Those individuals and their governments lodged claims against the Mexican government, and by the mid-1840s, these claims amounted to millions of dollars. This dispute over claims had soured relations between the United States and Mexico, and the annexation of Texas brought matters to a crisis. As part of the annexation agreement, the United States government had consented to recognize Texas's claim to the Rio Grande boundary and to provide military protection to defend that boundary. For its part, Mexico had never given up hope of winning back Texas, and the United States' annexation, together with the assertion of the Rio Grande boundary, the placement of U.S. troops along the border, and the longstanding claims disagreement, led Mexico to break off diplomatic relations with Washington and accuse the United States of initiating war. In response, Polk sent a representative to negotiate with the Mexican government, offering to buy California and New Mexico and relinquish U.S. claims against Mexico in return for a recognition of the Rio Grande boundary. The Mexican government refused to negotiate, and by spring of 1846, skirmishes were beginning to break out along the border. Polk requested that Congress declare war, which it did by an overwhelming margin. Though the United States lacked a powerful professional army, volunteers signed up in droves. The war lasted until September 1847, when the Mexican government agreed to enter into peace negotiations. In the resulting agreement, the Treaty of Guadalupe Hidalgo, Mexico agreed to recognize the Rio Grande as the boundary of Texas and to cede New Mexico and upper California to the United States; for its part, the United States agreed to relinquish all claims against Mexico and to pay the Mexican government $15 million. The third major foreign policy issue requiring Polk's attention was the dispute between the United States and Great Britain over the Oregon territory, which stretched from the northern boundary of California to the Alaska panhandle, including what is now Oregon, Washington, and British Columbia. Both countries claimed the area but had agreed in 1818 to occupy it jointly, with the provision that either party could terminate the agreement with a year's notice. The United States had repeatedly requested to resolve the issue by extending the forty-ninth parallel boundary that existed between the two countries east of the Rocky Mountains, but Britain had refused, insisting on the Columbia River as the boundary. The situation had remained unresolved, and British fur traders had continued to dominate the area into the 1830s. At that time, however, increasing numbers of U.S. settlers migrated into Oregon and pressed the United States to address their needs and defend their interests. After the 1844 presidential election, the issue became heated. As U.S. statements on the issue became more angry and aggressive, the British government grew concerned that war might break out, and it entered into earnest negotiations with the United States. In July 1845 Polk once again offered to draw the boundary at the forty-ninth parallel, but the British minister in Washington rejected the offer. Furious, Polk withdrew the offer, instead reasserting the U.S. claim to the entire territory. In his first message to Congress in December 1845, Polk continued this hard line on Oregon, asking Congress to provide the one year's notice that the United States was terminating its joint occupancy agreement with Great Britain. In addition, he asked that jurisdiction be extended to Americans living in Oregon and that military protection be provided to emigrants along the route to Oregon. Finally, Polk reasserted the Monroe Doctrine, which held that North America was not open to any further colonization by European powers. Polk's tough stance apparently spurred Great Britain to renew negotiations, and this time it agreed to the forty-ninth parallel boundary. The treaty was signed on June 15, 1846. 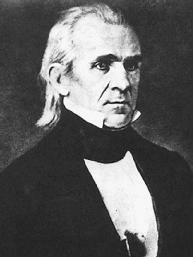 A principal goal of Polk's domestic agenda was to eliminate the high tariffs that had been imposed in 1842 under the Tyler administration. Polk believed that low tariffs were crucial for the success of the agricultural sector, and after strong and sustained Lobbying, he was able to persuade Congress to reduce tariffs in July 1846. A second focus of Polk's domestic efforts was the establishment of an independent treasury for the United States. Previously, the government's funds had been held in national banks or in various state banks, but Polk argued that the government's money should not be deposited in banks at all, but should be held in its own independent treasury. Despite Polk's many successes, presidential scholars agree that he utterly failed in his ability to foresee the catastrophic consequences that the Slavery issue would have for the nation. A slaveholder with plantations in Tennessee and Mississippi, Polk never actively defended slavery, but he failed to see the importance that it would have, instead believing that it was an aggravating side issue that hampered the resolution of more important problems. Polk left office when his term ended in 1849, remaining faithful to his election promise that he would serve only one term as president. Polk returned to Tennessee exhausted and in ill health. Just three months after leaving office, Polk died unexpectedly on June 15, 1849. He was fifty-four years old. Bergeron, Paul H. 1994. "James K. Polk." Encyclopedia of the American Presidency, edited by Leonard W. Levy and Louis Fisher. New York: Simon & Schuster. ——. 1987. The Presidency of James K. Polk. Lawrence: Univ. Press of Kansas. Haynes, Sam W. 2002. James K. Polk and the Expansionist Impulse. New York: Longman. Leonard, Thomas M. 2001. James K. Polk: A Clear and Unquestionable Destiny. Wilmington, Del. : S.R. Books. Pletcher, David M. 1996. "James K. Polk." The Presidents, 2d ed., edited by Henry F. Graff. New York: Scribner.